A stunning Columbian Emerald and Diamond trilogy ring featuring a vibrant pear shaped Columbian Emerald accented by two scintillating brilliant cut sparkling Diamonds. 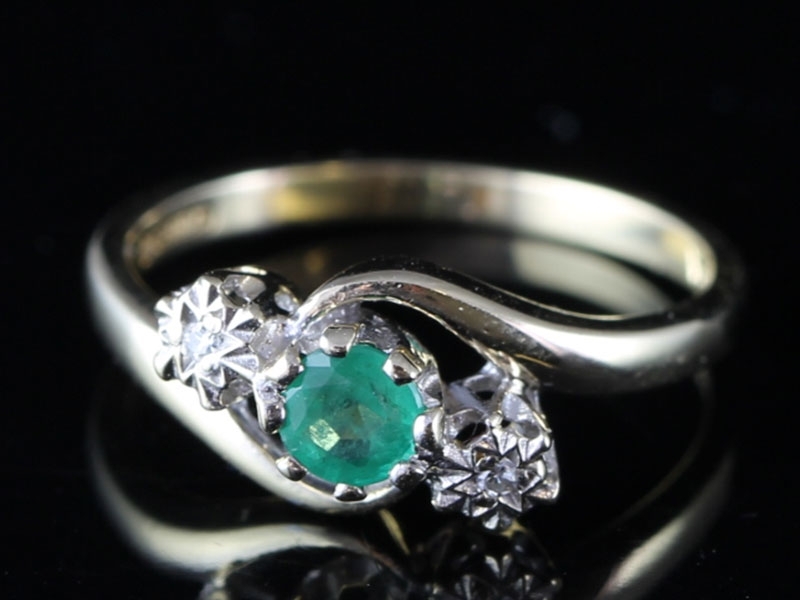 This beautiful ring would add a splash of colour to your collection. 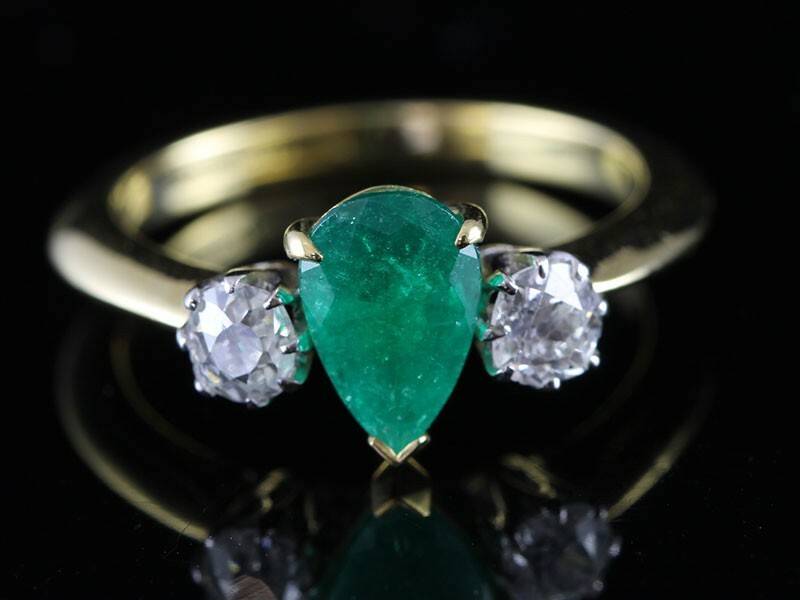 An exquisite 18 carat Gold five stone Colombian Emerald and Diamond Gypsy ring set with three Colombian Emeralds interspaced by two Diamonds. 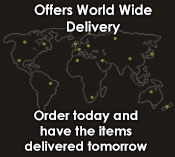 Giftwrap your finger in chic and stunning Deco style. 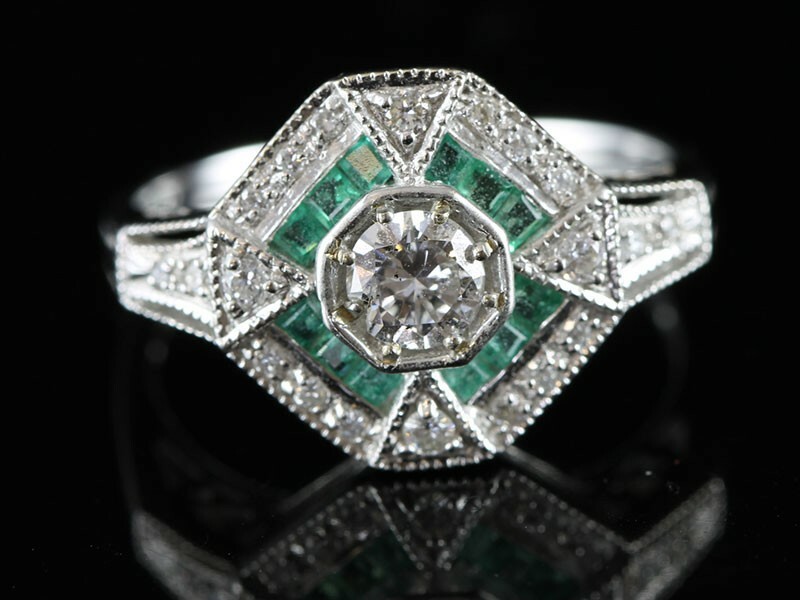 This truly gorgeous Art Deco inspired style ring is set with a one carat old mine Colombian Emerald. 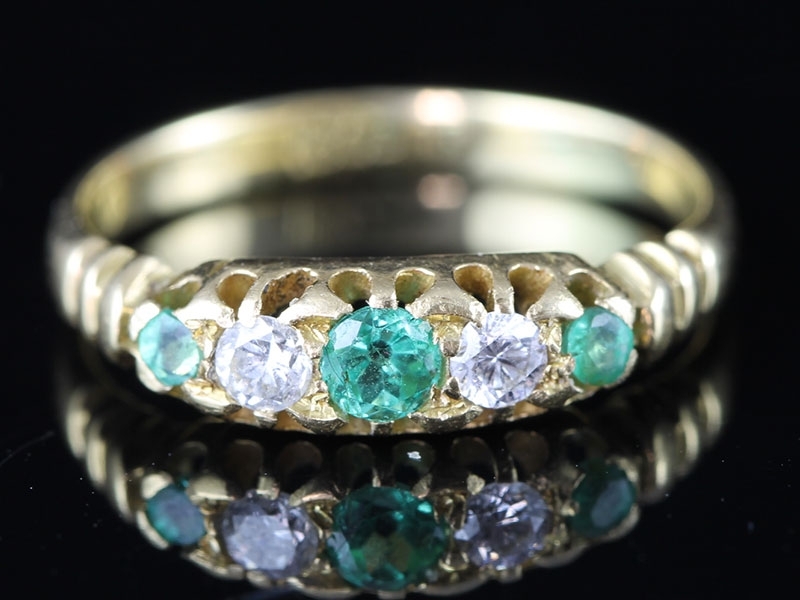 The rich, deeply saturated, green gemstone is collate set showcased by 34 sparkling old mine Diamonds. This stunning Art Deco inspired ring can only be described as a graceful 18 carat Gold delicacy. 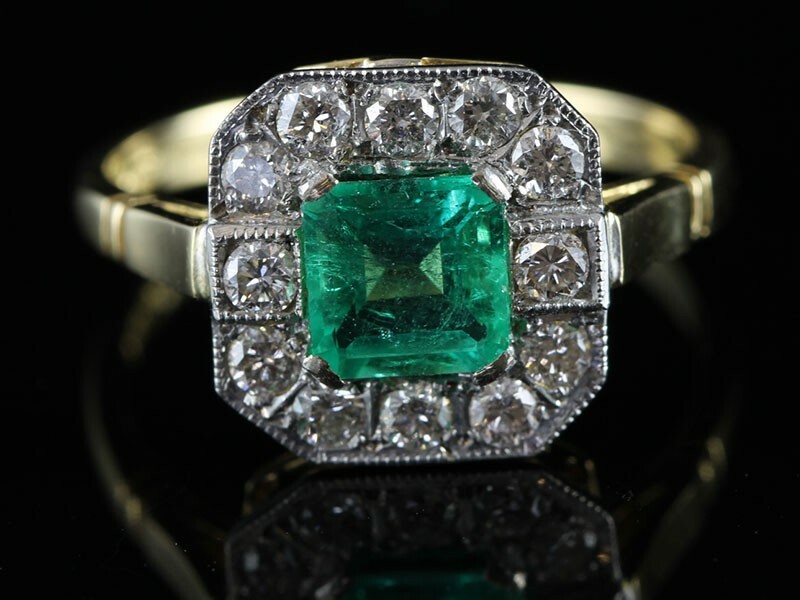 The central dazzling Brilliant Cut Diamond is collate set and framed with stunning princess cut Lively Green Emeralds. Set with the most beautiful natural Emerald which is a pretty Spring Green colour and is four claw set in 18 carat Gold with dazzling Brilliant Cut Diamonds. A stunning Columbian Emerald and Diamond trilogy ring featuring a vibrant pear shaped Columbian Emerald accented by two scintillating dazzling Old Cut Diamonds. 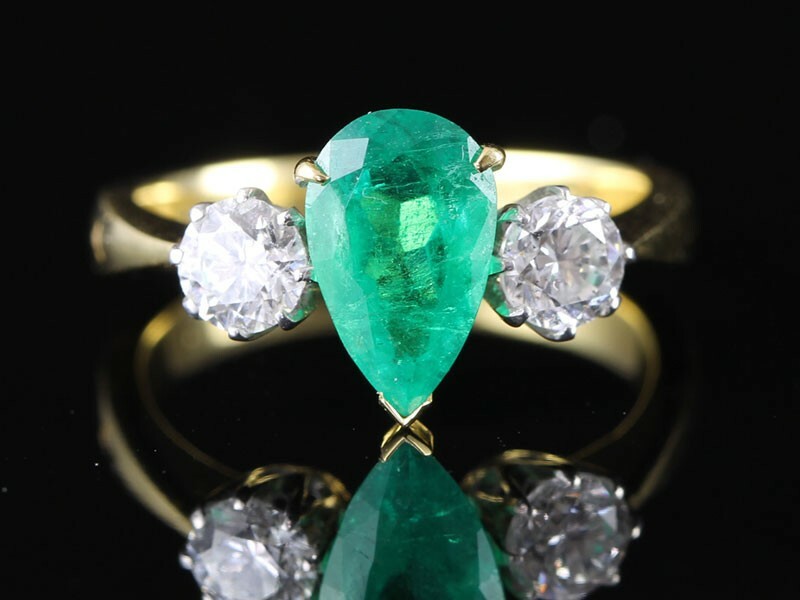 Set with the most beautiful natural Columbian Emerald which is known as a cr�me du menthe Green colour and is claw set in 18 carat Gold with dazzling Brilliant Cut Diamonds. 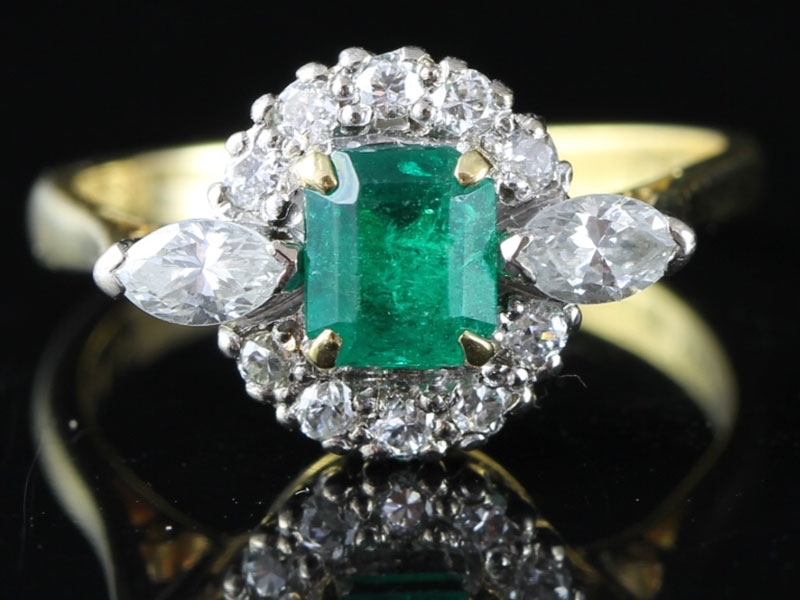 Here is a magnificent ring set with the most fabulous Emerald and Diamonds that sits so well on finger and certainly sparkles day or night. 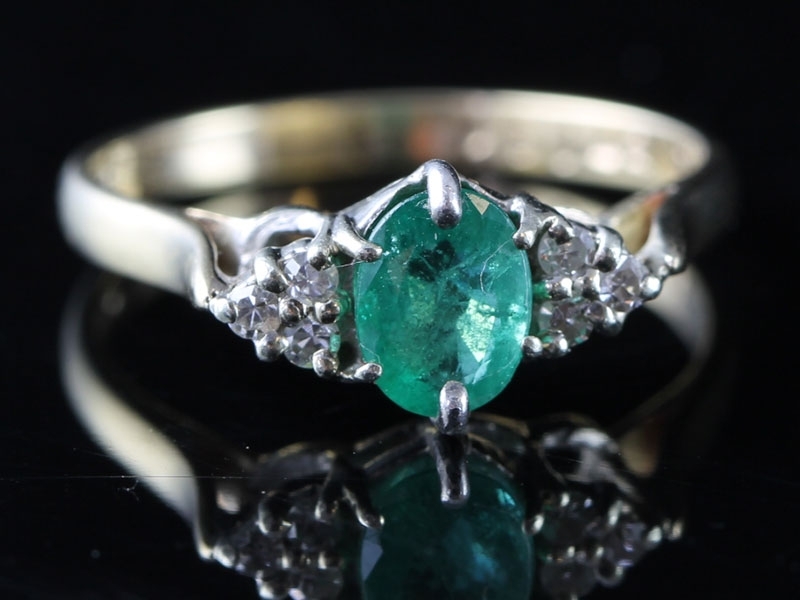 This Columbian Emerald is completely natural although vibrant with intense colour and depth. 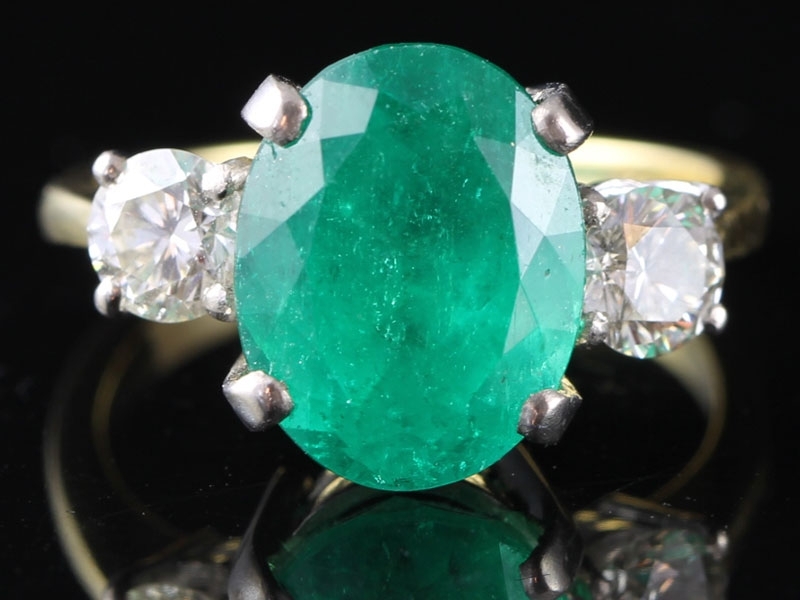 The proportion in the size of the prominent Columbian Emerald and the peripheral sparkling Diamonds is most attractive. This very pretty ring with an oval Columbian Emerald of 0.75 points in the centre, flanked by Diamond sparklers, can dress up the workday look and transition nicely to light up the evening! 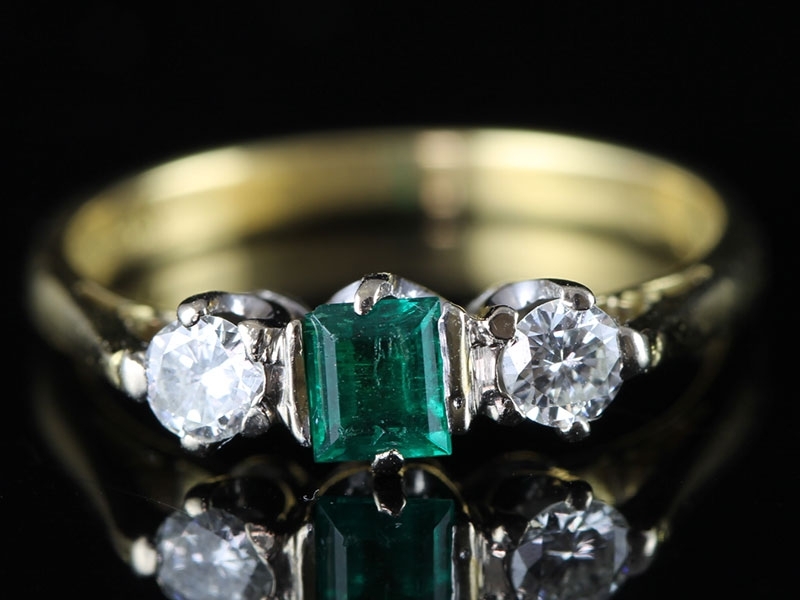 Experience the relaxing deep rich green light play on your finger as you turn this natural Columbian Emerald set between two stunning Diamonds on this trilogy ring representing your past, present, and future. 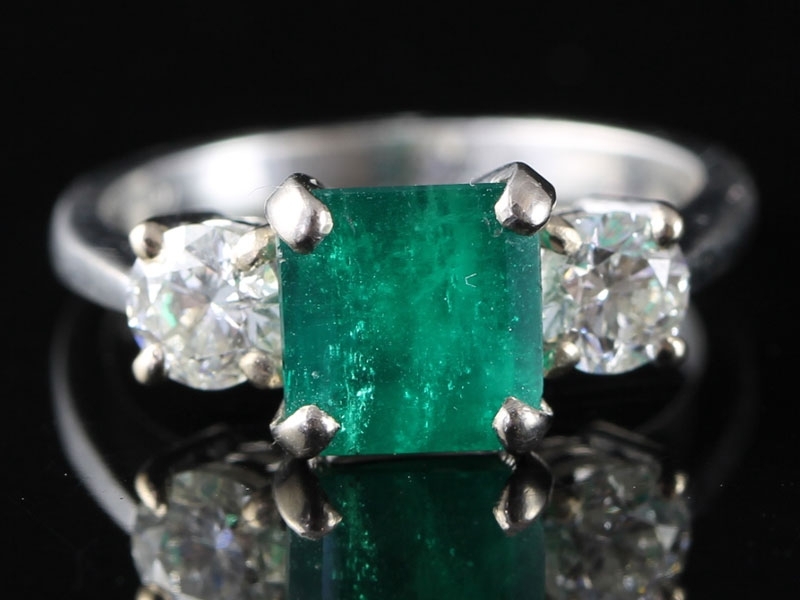 This fabulous and impressively proportioned Emerald and Diamond ring boosts two round Deep Rich Green Columbian Emeralds interspaced by three Bright White sparkling Transitional Cut Diamonds. 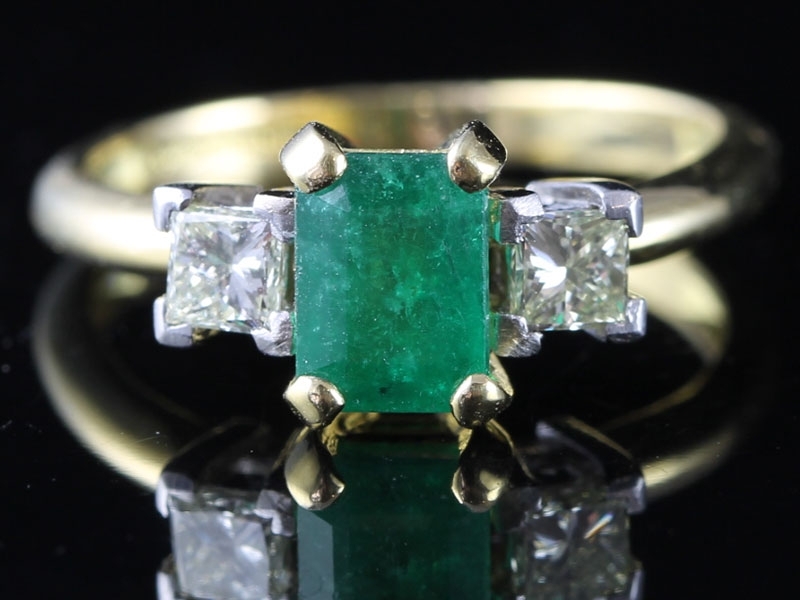 A stunning, half a carat Natural, Rich, Lively Green Colombian Emerald that has a superb mouthwatering hue and is hand crafted in an 18 carat yellow Gold gallery and surrounded by one carat of Brilliant Cut sparkling Diamonds. 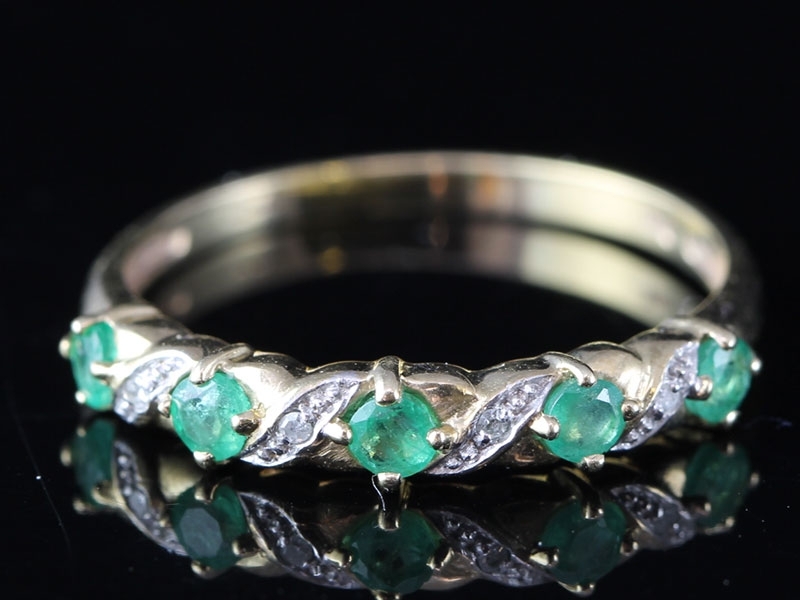 This fabulous ring is set with a genuine earth-mined, oval shape quality Columbian Emerald. 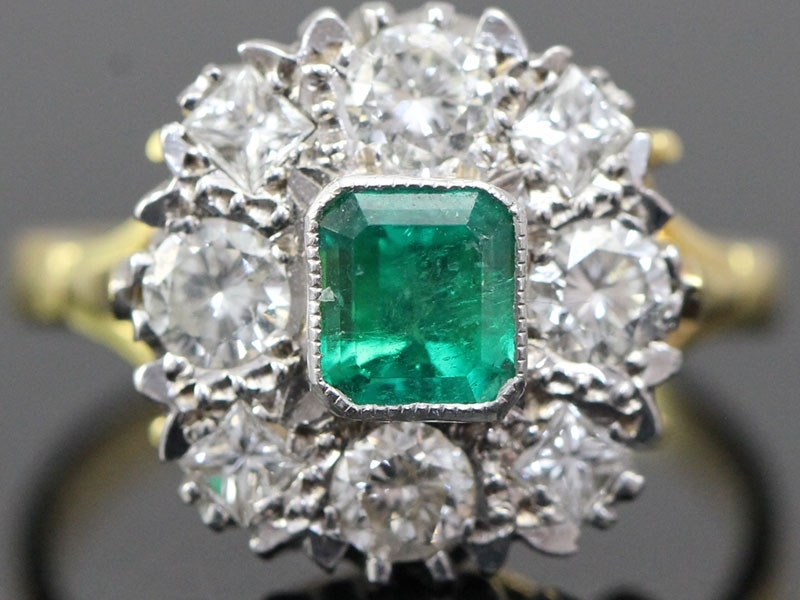 This Emerald is of beautiful Rich Grass Green colour, weighing a very impressive 5.25 carats and measuring 10mm x 13mm alone, simply lovely and a sheer delight to wear. An elegant, gorgeous, richly saturated, Deep Green Princess Cut Columbian Emerald - measuring 7mm x 7mm - radiates from between a pair of Bright White, Brilliant Cut sparkling Diamonds. A wonderful Velvety Green Emerald, weighing one carat, shimmers and shines between two sparkling marquise Diamonds and a halo of Brilliant Cut Diamonds in this impressive ring. 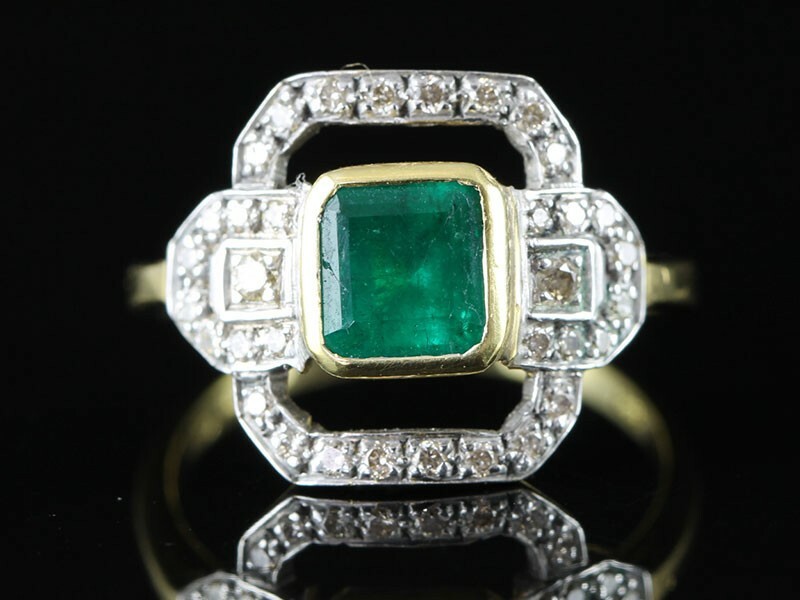 A stunning Bright Lively Green Columbian Emerald is the central attraction in this exquisitely designed ring. 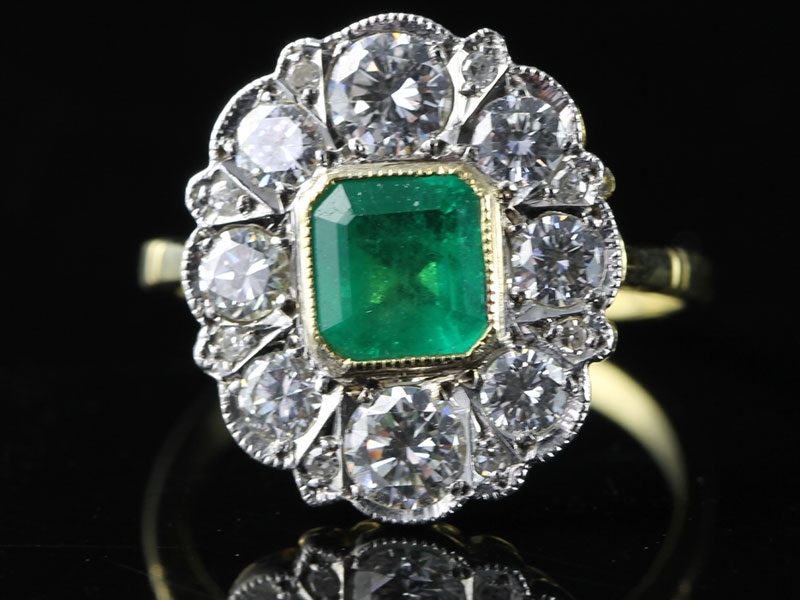 The stunning Columbian Emerald is bezel set in yellow Gold which offers warm tones to the Rich Lively Green stone. 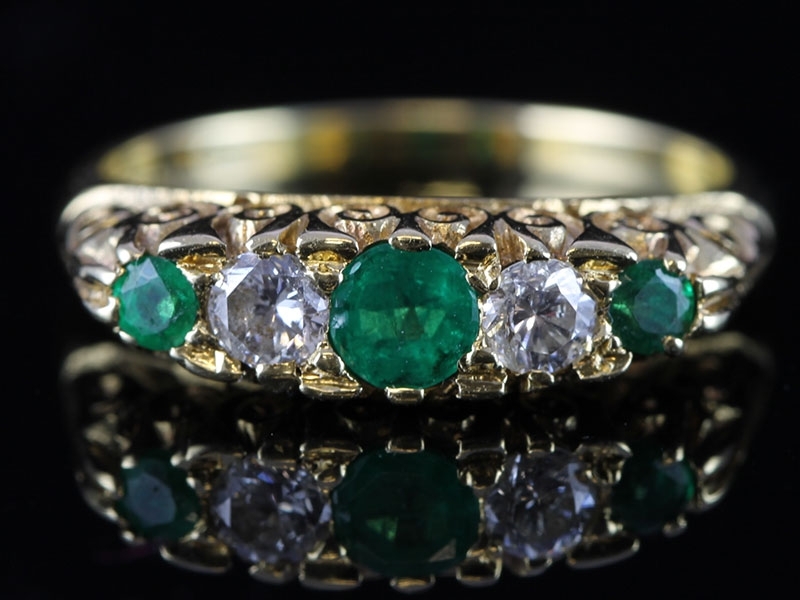 This artistic ring features eight Columbian Emeralds all collet set in 18 carat yellow Gold surrounded by a halo of bright white sparkling Diamonds. A ring guaranteed to take her breath away. 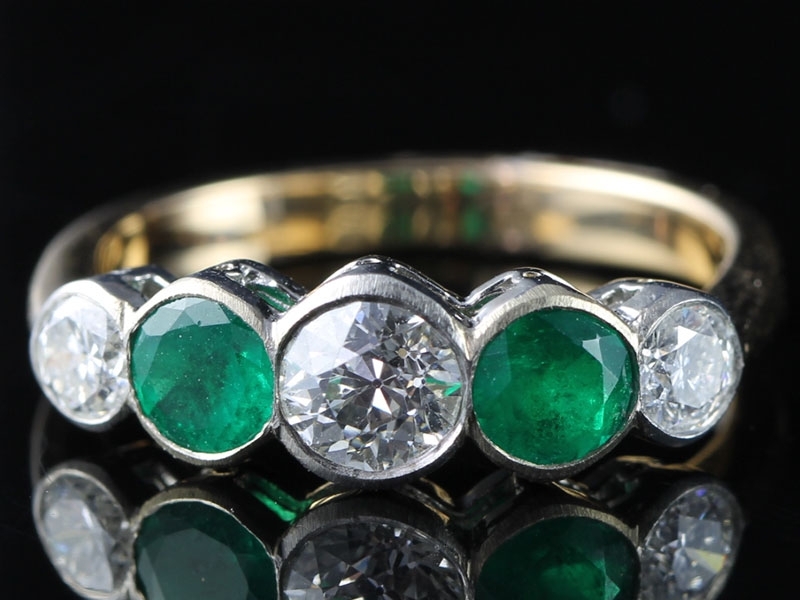 This beautiful ring has a row of five round cut Emeralds alternating with round brilliant cut sparkling Diamonds. 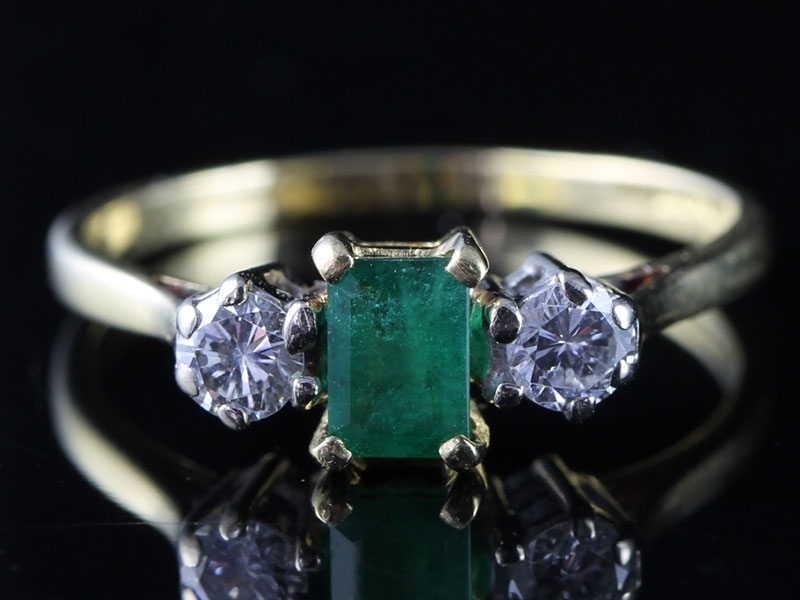 A lovely 3 stone Diamond and Emerald ring. 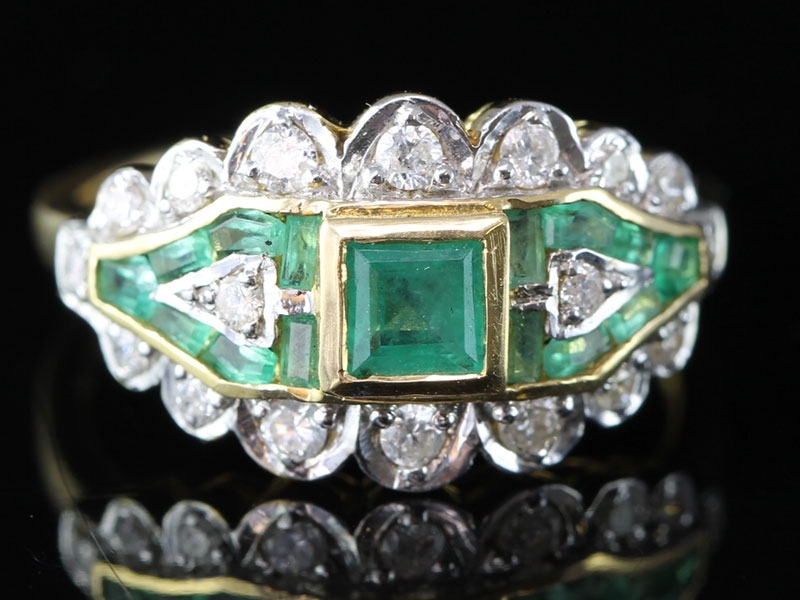 A center lively grass green Emerald is securly prong set in 9 carat white Gold and flanked by two tiny illusion set twinkling Diamonds that flows into a 9 carat yellow gold twist band.